Bluestar Silicones sees innovation as part of its DNA and a key to the company’s profitable growth. Lisa Wheeler, human resources director with Bluestar Silicones, describes how readySC™, Apprenticeship Carolina™ and York Technical College helped provide the workforce that powers this culture of innovation at its facility in York, South Carolina. 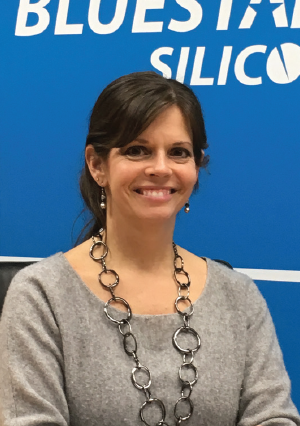 Lisa Wheeler: Operators who have worked in manufacturing, especially those who have worked with silicones or chemicals are very desirable to us. Our employees must also have excellent communication skills, attention to detail and a strong customer orientation, aiming to produce quality work regardless of the position they are in. 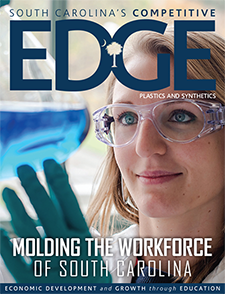 EDGE: Over the years, how have readySC, Apprenticeship Carolina and York Tech helped to recruit and train your skilled workforce? Are there any challenges that this training has helped you overcome? LW: When we opened the York facility in 2011, we had to combine our existing workforce with new hires to staff the site. We found that we had a lot of training to do. We had to overcome the challenge of developing our leaders and creating standardized training for key positions in our operations. The team from readySC was there to help! They worked to understand our needs and to help us customize and deliver training. They provided us with training in areas such as leadership, train-the-trainer and forklift safety, just to give a few examples. Additionally, we worked with Apprenticeship Carolina to develop an apprenticeship program for our chemical operators. The apprenticeship program allowed us to develop a skilled team that makes quality products to help our customers realize their potential. We are currently developing additional apprenticeship programs for quality and maintenance positions. We’ve also had supplemental training provided by York Technical College and we advertise our open positions on campus as well. EDGE: What are the benefits of registered apprenticeship to your company? LW: A positive result from the apprenticeship program for our company is being able to provide consistent training for our operators. This consistency helps us to maintain a safe environment, and it also has resulted in the retention of employees. We are excited to have our first group of apprentices graduating from the program in early 2018. EDGE: How do you think apprenticeship will help your company’s long-term workforce needs? LW: We see our workforce changing. We must plan for our long-term employees retiring and ensure that we have a competent workforce in place to meet our continued growth. We will continue to hire talent to support our customers and sourcing this talent will be key. Graduates that understand a manufacturing environment, basic chemistry and solid math skills, along with a continued desire to learn and a positive can-do attitude are extremely valuable to us. 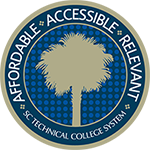 EDGE: If you were to recommend readySC, Apprenticeship Carolina and the SC Technical College System to another company, what would you say? LW: The team connected with each of these programs is a great resource. Building a partnership with them is critical to the success of each offering. They keep us current on what’s available to help meet our needs, and they guide us through each process. They make things clear and simple to follow so that our team and business benefit with ease. They are very customer-focused and supportive of business growth within the community. LW: It is Bluestar’s aim to provide silicone solutions with a personal touch…the people we have worked with in South Carolina have demonstrated by their actions that they too believe in providing solutions with a personal touch. We have had very positive experiences with them and look forward to continuing to work together to meet our future workforce and training needs. Bluestar Silicones, an Elkem company, is one the world’s leading fully integrated silicone suppliers, with more than 60 years of silicones expertise. With $575 million in sales globally, the company has manufacturing operations throughout the world, combining upstream silicon operations and capacity with downstream silicone market and application development expertise. Bluestar Silicones supports a diverse range of specialty markets with its silicone technologies and customized solutions, including oil and gas, paper release, textile coatings, healthcare, moldmaking, rubber fabrication, automotive, aerospace and personal care. Bluestar Silicones is a division of Elkem, a world-leading producer of silicon, ferrosilicon, special alloys for the foundry industry, carbon products, microsilica and integrated silicone manufacturing. Elkem has annual sales of $1.7 billion and employs 3,600 people around the world. Under the leadership of President J. Christopher York, Bluestar Silicones North America is poised for growth with market and product line expansions supported by its manufacturing facility located in York, South Carolina. The company’s strategic plan is to position Bluestar Silicones as a significant silicones player in the North American market. In December 2013, Bluestar Silicones’ York facility achieved certification under the Responsible Care® Management System (RCMS). The site also is ISO 9001 certified. Bluestar Silicones has been in South Carolina for over 30 years, having started business here in 1984. The company has steadily grown its business and its employee population since then. Currently, 160 employees are employed in North America, with approximately 115 based out of the York site.